"Stolen waters are sweet, and bread eaten in secret is pleasant"
Besides the Old Library, there are numbers of isolated climbs or groups of climbs which do not fall into collegiate classification. Although the climbing is in each case very different, they all have certain common. characteristics which distinguish them from college buildings. There are no petulant dons to be inadvertently awakened. No sabre-toothed porter is on his nightly prowl for blood. All is heliotrope and honeysuckle. But on the other hand, it is impossible to be away from the policeman's beat, and he may take a lot of persuading that we are not burglars should he happen to come across us. And until midnight the proctor is likely to come round the corner at any moment, very much less friendly than the policeman. Take no heed of his "Come down, sir". The bulldogs are a tough breed, but on a building they are like porkers trying to swim. Stay as high as you can. Even if you are trapped with no alternative way of descent, lie quiet. They will then think you have scrambled down the sheer face of nowhere and gone away. Figure 8-1. The O'Hara Drain-pipe. The O'Hara Drain-pipe. By Quayside, near Magdalane. One of our party made a remarkable escape from a proctor up this pipe. On the opposite side of the river to Magdalene, on Quayside, there are two pipes running up outside the Officers' Training Corps. Quite a worthy little climb is to go up these two pipes and pencil one's name on the white signboard which surrounds them half-way up. We believe that it is impossible to reach the roof by this route with the pipes in their present state. There was nothing dramatic in the photograph showing the policeman at the foot of the pipe; he obligingly posed for us. Figure 8-2. Friend or foe? Friend or foe? Or alternatively, "Come down, blast you sir, come down." There is another pipe thirty yards to the right, on the white wall of the corner house, of which we include a photograph. This is not to encourage other climbers to tackle it (hardly good manners on a private house) but because it was once the scene of a remarkable achievement. 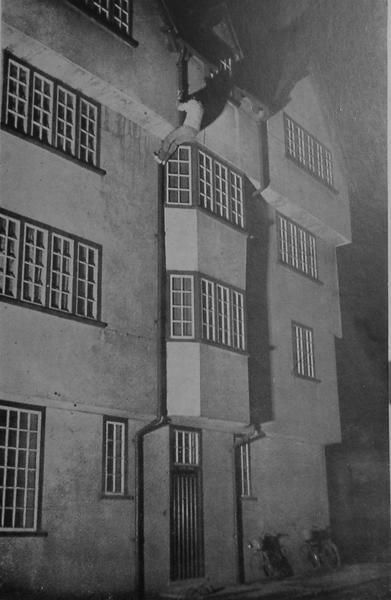 Three climbers were on Quayside at eight o'clock one evening, preparing to drive off to one of the colleges to take some photographs. While the driver was turning the car, the second man was screwing bulbs into the reflector and the third was coiling the rope, which he threw into the car. He was without cap or gown, and when a proctor appeared thirty yards away he dived for the nearest drain-pipe (the "O'Hara Drain-pipe", see photograph). Fortunately the pipe was firmly clamped and stood away from the wall. The two overhangs presented no difficulty, and he was soon up at the top. There were no hand- or foot-holds to help him except the pipe, and it seemed that he must come down again. Level with his head was an untrustworthy gutter, and a sloping tile roof stretched up above. While the proctor and two bulldogs stood below watching him with awe, he slowly worked his way up on to the roof and out of sight. The sloping corner by a gabled 45 window enabled him to make the hold-less ascent up an incline of forty-five degrees to the horizontal. When we asked him afterwards how he enjoyed this last little bit, he said he could remember nothing except a tremendous boom of laughter from one of his colleagues down below. 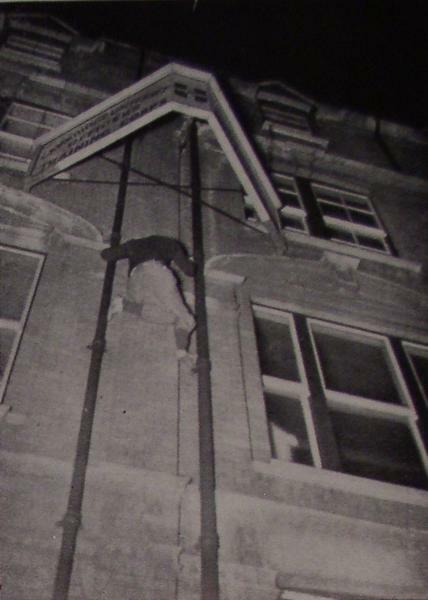 Crossing over the roof, he found a possible pipe the other side, and while the proctor was investigating inside the house he came safely down to earth. Now comes one of those little touches whereby truth scores over fiction. Instead of walking away for five minutes, Or taking a stance down the street whence he could watch with safety, he must needs wait in the hope of joining the little crowd that was gathering to watch. The idea of watching the bulldogs' teeth combing the rooftops for a man who was standing close at hand, an interested spectator, appealed to his Irish imagination. But alas! he was never destined to join the onlookers, for he was caught. One of the bulldogs at least was disappointed at this end to a gallant attempt to evade capture, and confided to the writer that it was "the smartest bit of work" he had ever seen. We were inclined to agree. And now we must move on. The climbs of this chapter are dotted about Cambridge, and we may not stand and gape like the two men whom we saw an hour later on Quayside, listening to the words of a witness as he pointed at the pipe. The easiest of these scattered climbs is the ascent of the Divinity Schools, opposite to the Main Gate of St. John's. The building falls back, thus breaking up the climb into two stages. Both of these are easy. On the front, running up by the right-hand window, is a short pipe. From the bowl of this pipe the parapet can be reached, and in five or ten seconds from leaving the ground the climber should be safely over. Keeping close to the right-hand wall, we edge past a worthy in a niche. A sloping ledge on the wall leads up to the farther wall, and we must go along this ledge. It is rather narrow, and we must go with arms stretched out sideways, close to the wall. The fact that there is a drop of only five feet behind us deprives this manouevre of excitement and we reach another short pipe. From the ledge we can reach the bowl of this, which is about four feet short of the top. A wriggle and a press-up, and we can reach the top with one hand. Should anyone find this difficult, let him turn towards St. John's Street, when he will find that he can wedge the length of his left foot between the pipe and the wall. This is not necessary, but some people find it easier. On the roof we turn right, and walk along the leads for about five yards, until we can go no farther. A somewhat rotten wooden ladder takes us up over the slates and down the other side, where we find ourselves by the Onion. This is a squat, domed tower surmounted by a stone cross. With a long step we can get across on to it, and with a careful press-up we can get on to the parapet chest high. This is as high as the single climber should go. From the parapet he can easily reach the stone knobs near the top, but these do not appear to be very safe, For two climbers it should make quite a pretty little climb. On one occasion we wanted to take a photograph of a climber on St. John's Main Gate, across the road. It was decided to flash from the side of the Onion, with the camera half-way towards the Hawk's Club, on the ground. 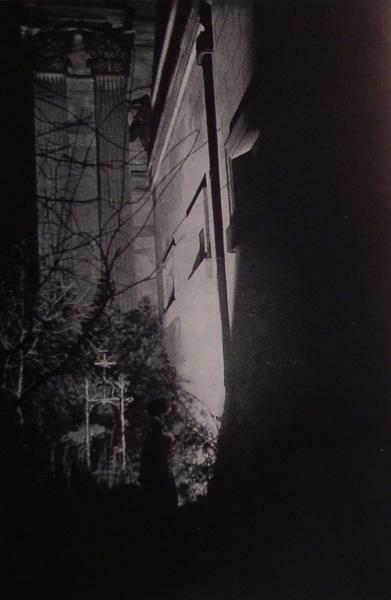 With a string round his waist the flash-man went up to the roof and hauled the apparatus up silently after him. With folds of loose string all around him he stumbled over the wooden ladder and took up his position by the Onion. As the camera and flash men could not see each other, they had arranged to whistle when each was ready, and then the flash-man was to whistle four times and flash on the fourth. Before this, it should be said, the climber was to wave a white handkerchief four times when he was ready. All started according to schedule. The handkerchief waved, whistle answered whistle, and four pips announced the critical moment. The camera clicked, the flash-man pressed, and the climber tried to look dramatic. But nothing happened; the apparatus had failed. The flash-man tried again with the same result. To an outside observer the next five minutes must have been faintly ludicrous. The flash-man lost his head, and kept up a continual barrage of pips while he shook the apparatus, banged the reflector and pressed the trigger. The climber, slightly confused, flapped a handkerchief with equal vigour although no one took the slightest notice of him. So that no one should say that he was wasting time, the camera-man let off an occasional toot. Then, in the stillness which followed, the flash went off "of its own accord" as the flash-man said. It was a good twenty minutes before he had come down, recharged the apparatus and gone up again. The unfortunate climber on the top of the Main Gate nearly died of exposure; it was a chilly night with a strong wind blowing. It took us three attempts to get photographs of the Divinity Schools. On the first occasion all went well, but the photograph failed to come out; on the second, the proximity of a plainclothes detective marred things; on the third, we succeeded. From the wing to the top of the central part of the building is about ten feet, connected by iron hoops fixed into the wall. Or, if you prefer it, there is a stump of drain-pipe. The upper roof is not very interesting. It is possible without further climbing to get to the top, even higher than the Onion. 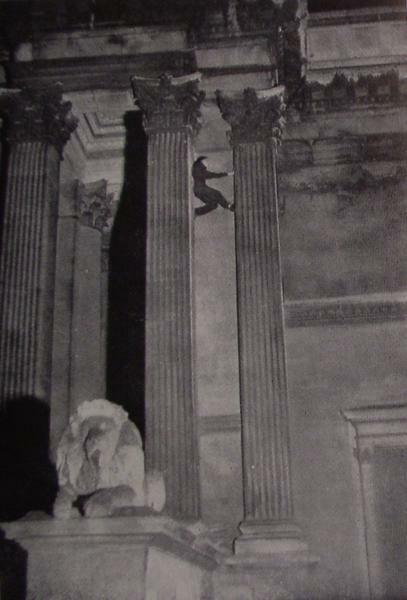 The climbing of the Senate House is one of those misty legends which owe their glamour to their complete lack of definition. We have heard the ascent attributed to various people, notably to a certain athlete whose name was very widely known for his versatility and outstanding achievements. There is something more appealing about an unverified legend than the strict facts and dates of history, and we have purposely refrained from writing to ask him whether there is truth in the legend. The easiest way to prove that a climb has been done is to repeat it. We therefore set ourselves to study the Senate House, and found it tantalizing, in that it looks easy, and yet had defied the efforts of our various friends who had tried it. A number of chimneys run up its faces, but they are either too narrow or too broad, and too shallow into the wall. We managed to struggle a few feet up one of the broad ones, and so dare not say that the chimneys are impossible. A possible way for two climbers might be the windows on the south face. They have ledges nearly two feet broad, and an upper window might be reached by a climber standing on his companion's shoulders. He would then lower a short cord or rope for number two to follow, and they would then have to repeat the process on the ledge of the upper window, at a height of twenty feet or more, to reach the roof. This may sound fanciful, and we only offer it as being, in our opinion, the most likely way in which the Senate House could be climbed direct. The easiest way, which may perhaps be considered an evasion, is to climb the face of Caius and drop across the Senate House Passage, a distance of about seven feet at the narrowest part. Having decided to do this, we tackled the south face of Caius. South Face of Caius. This must be climbed in order to reach the drop over to the Senate House. Climbing up the window to the right of the archway, reach the sill of the window above. Then a hand-traverse along a ledge to the left, past the pipe until the left foot can reach the curved flange, projecting for an inch from the wall, above the archway. Should you prefer it, you can walk along the ledge, using the pipe for balance until you can reach the window-sill on the left. Standing on this window-sill, your only handhold is the cross-bar, waist-high. Standing on the steel bar of the window-sill (see photograph) and with one hand on the cross-bar, you can just reach a small ledge above your head. With both hands on this (it is only two or three inches broad) pull up on to the cross-bar. You can now reach a ledge just over two feet above the other. The lower ledge is now chest-high, and there arc no foot-holds between it and the cross-bar below. The obtuse angle to the main wall formed by the base of a bay window now helps. Laying the left forearm flat on the lower ledge to the left, and holding the upper ledge with the right hand, pull with the right hand and push up with the left. With a knee on the lower ledge it is comparatively easy to scramble up. At this stage of the climb one is acutely conscious of how much depends on the soundness of the stone of the two ledges. Fortunately, all the stone-work except the gargoyles on this building is in excellent condition. From now on the climb is easy. With the help of a stony celebrity on the right (on whom take care to press downwards as much as possible, and not outwards and sideways) we can reach the roof-level. Over the top of the bay window. a delicate moment's traverse to the left, and we can walk along the leads to the end. From here on to the Senate House looks pretty formidable. Tradition has it that a drunkard once jumped across. and having sobered up in splendid isolation, found that he dared not jump back. Continual coaxing and the sight of many friendly hands waiting to grab him on arrival finally caused him to cross the gulf again, and he arrived without mishap. Our method was less dramatic. Behind the stony parapet the roof runs up very steeply, for ten or more feet. On the top is a leaded square, ten yard, broad. known as the flag plateau. It is an easy scramble on to this, and three members of the party went up while a fourth tied a rope round his chest. A fifth roped himself to the outside of the stone balustrade to hold number four's feet. 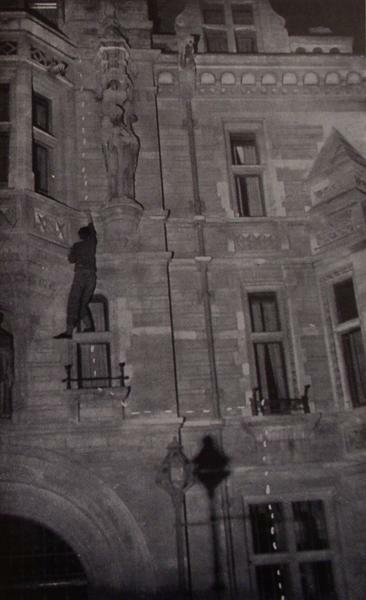 The flashlight man and camera- man were in the street below, and the three men on the flag plateau held the rope. The wretched man on the end of the rope found that to stand on the edge of a high building and drop forward requires will-power, and the two down below listened to his mental conflict with interest. When finally he toppled over, the rope was not paid out quick enough, and he swung round back to the wall. A second photograph was obtained of his body span- ning the gap. The fact that both these photographs were spoilt by the laughable omission of the camera-man to close the shutter was an amusing detail of the evening's work. The incident on the roof of Marks and Spencers is perhaps worth recording. It was one of the very few occasions on which any of our party trespassed on to private property, and we only record it because of the brilliant escape of one of the two men concerned. One of the Cambridge members of our party was concerned at the lack of pinnacles in our photographs. What the lay reader wanted, he said, was not drain-pipes and chimneys, but bodies crawling over pinnacles like bumble-bees on a foxglove. There was one particular pinnacle he had in mind; the spire above Lloyds bank at the bottom of Petty Cury. We knew the place. The idea of climbing it had long ago occurred to us, and after prolonged study we had decided that the face of the building below the pinnacle could be climbed. We had never entertained it seriously because it was a private building, but now the pinnaclomania that was infecting the party paralysed our better judgment. We went off with him to investigate. It was a bump-supper night, and everyone in Jesus College who was not drunk appeared to be dancing round a bonfire. Our intention to investigate the Lantern (another pinnacle) in that college was frustrated by a porter, who would not allow us to go into the court in question. So we went off to look at the Lloyds pinnacle, intending to collect the rest of the party later for a photograph if the climb proved possible. Climbing over some railings by the Central Cinema, we went from roof to roof under the brilliant glare of a full moon. Passing over Marks and Spencers we were particularly noisy, and after going up a short pipe on to a sloping roof (with the help of a chimney-stack) we came to the base of the spire. To climb half-way up was comparatively easy, and the rest of the way was up a lightning-conductor, with no outside holds. After testing the staples, which were beautifully firm, we de- cided that the top might be reached. But it was a climb which should not be done more than once, as each attempt would tend to weaken the conductor, and near the top the climber's safety would hang, at the most, from two or three staples. So we re- turned to find the rest of the party, whom we had arranged to meet at eleven o'clock. On the roof of the bank we heard some noises which caused us to think, but not to worry. Having returned to the roof of Marks and Spencers, we decided to investigate the roof of the Central Cinema. But we found it necessitated a long circuit, and after sheltering for ten minutes from a shower of rain, decided to go down again. 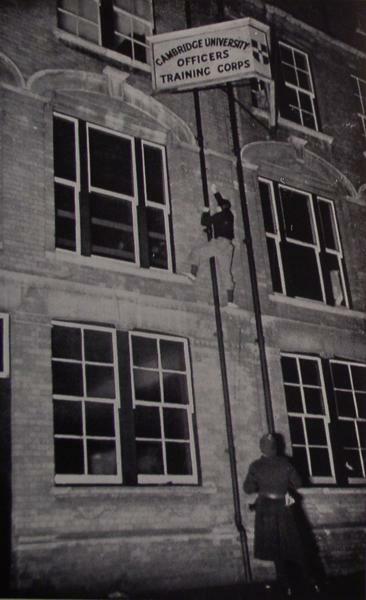 There was a ladder on to a lower roof, and the first climber was half-way down when two torches appeared on the lower roof. It still continues to sing. "At 2 A.M. I left amidst the general blessings of the police force. I was anxious about C., as the Welsh sergeant had said there were pools of blood in C.'s track, and that he must be suffering from serious loss of blood. However, on the off-chance that he was pulling my leg I had professed to be hugely amused about it, and said I did not care whether C. was hurt or not. It subsequently turned out that the Welshman had been pulling my leg; he was a good man." "As I passed M. and Spencers I saw a car outside. The manager had just turned up, three hours late. Resisting a temptation to say 'Wot, burglars? Let's catch 'em', I looked in and gently explained that I was the culprit, and had done it for fun. (This reluctance to let well alone will be my undoing some day.) The manager seemed pained and spoke reproachfully. 'Fun? My first night's sleep for a month is spoiled, and you call it fun.' I moved on." "The car had been moved into a garage, and the place was shut up. I went to the house of an employee three hundred yards away to get a key. He sent me to Mr H., in Haig Road, Chesterton. A Robert lent me his bike, asking me first how we had done the 'Save Ethiopia' stunt when he was on the beat. (How he knew it was us, I don't know.) 'You must have watched every step I took,' he said. 'Do you remember I spoke to a lorry driver who was leaning against the wheel of his lorry?' For an incident over nine months old this was not bad memory. 'Of course we were watching', I replied, remembering neither Bobbie nor lorry. He seemed to think we had timed it very smartly, and from what he told me we must have escaped being caught by only a few minutes." "Mr H. had once sold me a dud car for �60, but I was sorry to pull him out of bed. He came willingly and politely, but seemed a bit pained that I had not awakened more underlings first." "I was home by 5.0." Figure 8-5. 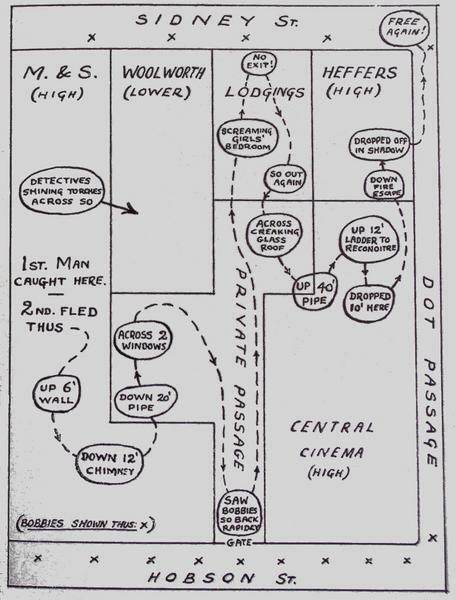 Diagram of the escape from Marks and Spencers. Meanwhile, number two had had an interesting escape. Without realizing what was happening, he decided that the career of a Trinity man caught on Marks and Spencers was likely to be cut short. He decided that this, if ever, was the time for blind heroism, and with a man coming up the ladder he popped up on to a smaller roof, six feet higher, and raced to the east side. Here there was a drop of twelve feet on to a small area of roof, about ten yards square. A chimney-stack enabled him to slither down, but he knew he could not get up again. On three sides there was a wall rising up; on the fourth. a drop down. If he could not find a suitable pipe in that ten yards of frontage, he must be caught, or jump. "Then out to street and looked over wall and saw it was hopeless. So back through door which I had luckily left open, and locked it on inside in case they had seen me. Then rushed into some lodgings and slap into screaming girls' bedroom. Apologized and told them to keep quiet and shot out again almost into the beam of the detectives' torches. Decided this was hopeless, so went into lodgings again up a flight of stairs into an empty room overlooking Sidney Street. Thought of dropping out as not many people about, but unfortunately an inspector was wandering about; also the drop was really excessive. So out again and saw that the guys with the torches had gone, so got across glass roof and then up about 4O-ft. pipe, which was tiring because absolutely smooth walls... sort of glazed bricks. At the top it seemed colossally public. I felt as though the whole town was looking until I saw every- thing going on quite normaIly below. There was a drop of 10ft. straight ahead on to roof of cinema, but I thought if I went down I could never get up again and there seemed to be no way off, so I went aloft higher by a ladder and walked over to where 1 saw the stairs below (fire escape); soon beat it down there and dropped off into passage, and walked away, which was rather an anti-climax. . . . I felt like a chase then!" We apologize for the length of this anecdote, and now we must return to the serious climber. The Fountain in the Market Place would be an ideal little climb but for its unsound condition. Unlike buildings be- longing to the colleges, the stone is really rotten and crumbly. Even the four central arches creak beneath one's weight and feel that they might collapse at any moment, so we did not attempt to reach the top. However, it cannot stay lung in its present state, for it is already half a ruin, On .Ihe off-chance that it may some day be repaired we include it in this book. It has several times been climbed in the past. Figure 8-6. Fountain in the Market Place. 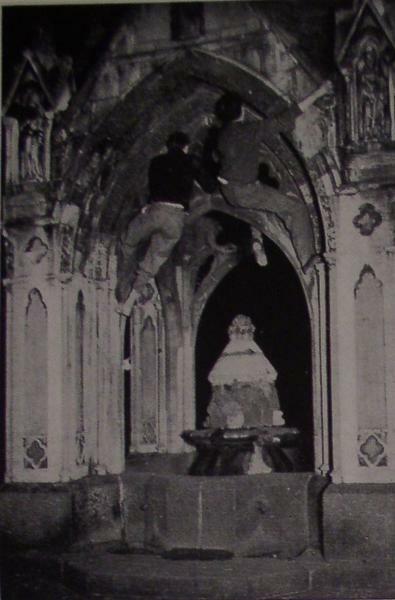 The boss in the centre of the Fountain may be used to help the climber to get into a sitting position on the arch. From there it is possible to get a hand round the corner. and if the masonry were safe the rest would be easy. At first sight it looks deceptively difficult. As there is nearly always a policeman in the Market Place. the attempt must be carefully timed. On one occasion two of the photographers had just come down from posing for a photograph when a policeman came round the corner. The Inefficient Photographer was driving, and as the climbers wanted to stay by the Fountain they signed to him to drive on, while they kept the Fountain between themselves and the policeman. Hopeless Harry drove round the Market Place. He then slowed up, totally unable to think what to do next, and finaIly went round a second time. Regardless of the fact that his behaviour was highly eccentric, considering the time and place (it was 3 A.M.), he started off on a third circuit. The situation was ludicrous. The Robert leant his bicycle against the Guild Hall, and turned to watch the weasel-like antics of this strange vehicle. The climbers behind the Fountain, like the Foreign Minister on equally absurd but more solemn occasions, decided it was time to intervene. They shuffled off, and amiably explained the whole thing to the policeman. He was a man with a grievance against the world — he should have been a schoolmaster but for the war — but he liked the Young Idea, so all was well. Meanwhile the Inefficient Photographer, convinced that his associates were in trouble, roared and rattled round the Market Place with more determination than ever. In his gear-changing there was something of the gabbling of a hen-turkey whose brood is threatened by a fox. The fierce rending of cog against cog must have awakened every sleeper for hundreds of yards. Finally the policeman asked to see his licence, and all enjoyed a laugh together, Hopeless Harry the loudest of all. It is little incidents such as this that make night climbing worth while. After this it would be well to leave the Market Place. Pro- ceeding down Corn Exchange Street, the Drain-pipe specialist is tempted by a number of stark-looking pipes on the right. The Chimney specialist hastily drags him on, and we abut into the east end of Pembroke Street. Double Drain-pipe work. The object of the climb is to sign one's name on the white board above. From here down to the Trumpington Road is the happy hunting-ground of all advanced parties. A guide-book of the size of the Guide to Trinity could be written round this fertile three hundred yards of road. We have spent hours lounging along here, tracing possible climbs over the face of the build- ings, memorizing, whether we would or not, almost every ledge and hand-hold for hundreds of yards. For the moment we will confine ourselves to two drain-pipes. At the corner of Corn Exchange Street is a thin lead drain- pipe running up past two windows to the roof. We decided to try this one. The pipe runs close to the wall, is slightly loose and not at all strong. The stone is slotted, but the slots are so narrow that it is only possible to get one finger behind the pipe. If the slots were wider and deeper it would be possible to walk up as though up a ladder, but as it is the climb is difficult. 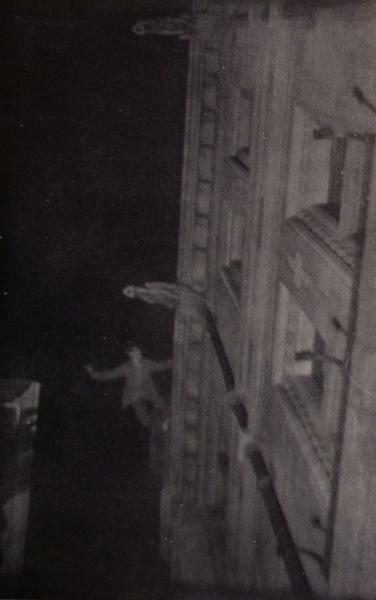 The photographers got no farther than the ledge of the upper window; they only attempted it once. On this ledge the climber concerned found himself in a pre- dicament. It was a bitter night, freezing hard and with a biting east wind. The heavy strain on his fingers had quite numbed them, so that he could not get up or down. FortUnately on this window-ledge there arc two ornamental pillars, round one of which he was able to pass the knotted rope, and so descend. It is a nasty climb. Ten yards to the left there is another drain-pipe which is much more attractive. It is of iron, firm, thick, and stands well away from the wall. To get to it a six-foot wall must be crossed. Hanging down at arm's length on the other side, one expects a drop of a few inches. Prudently looking down before releasing one's hold on the wall, one is horrified to scc the ground fifteen or twenty feet below the top of the wall. How ever, there is a light iron bridge a few yards away, and one can get across on to this. Figure 8-8. Drain-pipe in Downing Street. From this bridge one must get on to a window-ledge, six or seven feet above. This is not easy, but one is helped by a short length of pipe which sticks out four inches from the wall and makes a good foot-hold. With a traverse of a few feet to the right, we get on to the drain-pipe. Although we have only climbed six or seven feet, it is comforting to know there is a drop of twenty feet below us. The first time a member of the party climbed this pipe, he found it extremely tiring, and announced when a few feet from the top that he could go no farther. He was wearing gym-shoes, and found it very hard to get a good grip with them. 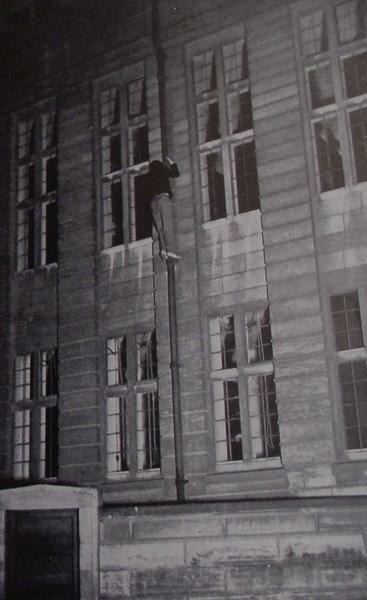 To encourage him the flashlight failed, and he had to come down again. He refused to go up a second time until later in the evening. This time he found it much easier. Instead of trying to edge his feet sideways into the slots, he kept his toes to the wall, with the heels pointing outwards. Like this he was able to walk straight up the pipe without strain or effort, and when he came down again was scarcely out of breath. This climber has de- veloped the peculiar habit of saying "Goodie, goodie" at the end of every climb. Every quarter of an hour or so some machine in this building makes a peculiar noise, rising from a low buzz to a loud whine, and then down again. Whether or not it is a burglar-alarm we cannot say, but if it is, then it is as ineffectual against roof-climbers as a scarecrow to a pair of magpies. Leaving this pipe at last, we go down the street towards Trumpington Road. Besides the innumerable severe climbs on the right, there arc several on the left, on the north face of Pembroke and on Pembroke Bridge. At the bottom we turn left, and proceed for a few hundred yards. "Rising about twelve, we went to collect the photos. Of the sixteen we had taken, sixteen came out. This was very satisfactory; some were quite good, some out of focus." "After supper, we still had not a third man. I called on Jack S., but he was out. Jim B. was also unable to come. At 10.30 I was telephoning to Mrs G. in Cambridge, and found to my joy that Ronnie was staying with her. So we arranged to pick him up at midnight, and left just after 10.40 P.M. We had previously spent a sociable evening at the club, and so were not feeling much like climbing. However, 1 could not waste Eric on his last night." "It was just on midnight when we picked up Ronnie. Parking the car in Fitzwilliam St., we slipped over the wall into the grounds of the museum, and round to the Lion Chimney on the right. It had turned much colder, and the others shivered as I ran back to fetch a spare bulb and the torch." "They took a photo of me at the top of the chimney (the same as the other night, only with the camera farther away and in front). This chimney, above one of the lions at the north-east corner, is of an ideal width, with vertical grooves to keep the feet (and body) from slipping sideways. "Then down again, and round to the back. On the way we noted the chimney at the north-west corner was also an easy one." "The chimney at the back is half-way along the west wall. The building drops back about ten feet, at the point where the old high building is joined by the lower middle building. To reach this point one had to crunch along some very noisy gravel. and some buildings beyond appeared to be occupied. A large bush of bamboo or similar growth screens the bottom of the chimney." Figure 8-11. The Fitzwilliam Chimney at back. "Surmounting a broad ledge at chest-level, .one stands comfortably in the chimney. With one's back in the corner, the opposite wall stretches two and a half feet to the left. Owing to the deep vertical grooves, one can chimney against the outer corner, which makes it easy. The left hand can get a good grip on the corner, where a narrow neck of stone provides a rounded hold which fits the palm of the hand." "To complete the luxury, there is a wire-rope lightning-conductor in the corner on the right. It is rusted, and if one uses it one must climb with one's eyes shut. Eric did not notice it until near the top, and managed quite well without it." "The only part needing special care is the ledge eight feet from the top. This narrows the chimney for a distance of two feet and with care can easily be surmounted without the conductor. We got a photo of this chimney. Eric was not long in joining me on the roof. Ronnie was impressed by our silhouettes on the roof against the moonlight." "From the roof to the top of the building on the left was a good twenty feet up a vertical wall. 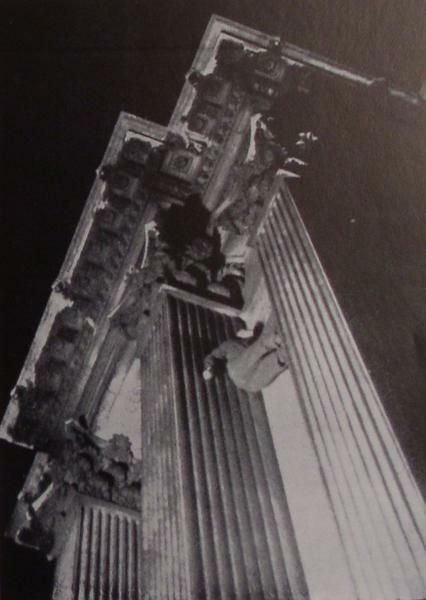 Further, there was a ledge half-way up projecting for four feet." "A strip conductor makes the climb possible. Holding it in one hand, one reaches back at an acute angle and grasps the ledge, on to which one pulls one's self. From there to the top is quite easy, and we sat on the top wall for a couple of minutes studying the geography of the place." "Immediately in front of us was a dome, rising for fifteen feet from a roof seven feet below us." "Eric was about to drop on to this roof when I saw the reflections on it in the moonlight. It appeared to be of glass. Eric. agreed that it looked like glass, but wondered by what architectural device a massive stone dome could be supported in the middle of it. This was certainly strange." "The stone of the dome was interspersed with narrow windows, below each of which there was a ledge just above roof-level. On to one of these ledges I gingerly lowered myself." "A hollow ping and the feel under my foot aroused my suspicions. The suspicion that one feels at the circus when the strong man juggles with gigantic spheres of steel came to my mind, and I stooped down. Nor was I wrong. The stone was simply sheet metal painted grey, as the drumming of my fingers conveyed to Eric. It was not long before I was back on the wall." "The colossal impudence of putting a dummy dome on a roof left us with a great respect for the architect. What manner of man was this, who with a few sheets of tin and a pot of paint could conceive the idea of imitating the stately curves of Constantinople? It was stupendous." "More than stupendous, it might become revolutionary. What had been done once might be done again, on a very much wider scale. With a pot of paint and a few sheets of corrugated iron, we might have feudal castles dotted once more over the land, as realistic to their inhabitants as to the stream of American sightseers they would attract. And provided William the Bad did not come with Ye Ancient Battering Rams, or the wind did not blow too hard, rural England would be the richer for their added beauty. Of course, if a swarm of bees got between the inner and the outer wall, yokels for fifty miles around would think that the tocsin was sounding for a new crusade, but this would not matter." "And yet it is slightly sad to think that even a building could wish to seem different from what it was. This was the first time we had caught a building using cosmetics, and we were abashed. Without more ado we returned to the lower roof." "A policeman testing doors on the opposite side of the street now attracted our attention. He tested the gate of Fitz Billy and then, to our horror, walked in." "I shouted down to warn Ronnie. He was taking a stroll thirty yards away, and rushed back with mighty crunchings to hide the paraphernalia (and himself) in the bush. The Robert heard nothing, and his measured tread walked by and faded away. P.C. X later in the night was vastly amused by this anecdote. He kept chuckling to himself, and told us that it was P.C. YZ, and that he had to go round the Fitz Billy six times in the night, at intervals of an hour and a quarter. 'He's only just married, so you wouldn't expect him to hear you.' We gave P.C. X the photograph of himself at the foot of the C.U.O.T.C. drain-pipe, with Eric half-way up." "After that to St. John's. After priming Ronnie how to work the camera..."
But the rest of the activities of the photographers that night docs not fall into this chapter. Suffice it to say that Ronnie was not primed enough; he bungled the photograph. A certain famous athlete once came to grief while climbing down from one of these first floor windows of Caius. A popular host as well as a triple blue, he annoyed the authorities by entertaining guests from other colleges after midnight, and he was anxious to avoid further trouble. One night at 12.30, during a hilarious party, he was told that the porters were about to raid his room. He hastily put all the beer glasses he could find on a tray, which he placed on one hand, and tried to climb down to the street. Even a trained waiter would have found this difficult, and in his subsequent fall he broke his ankle. To be explained in a later chapter. Just as well he didn't, as there were at least three bobbies watching the building on that side.